The NSO is delighted to report the government has approved an amendment to fully protect the kirpan in law. 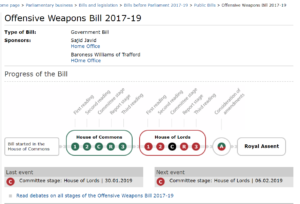 The Offensive Weapons Bill (OWB) went through its third reading in the House of Lords yesterday in which ‘the legal presentation of a curved sword by a follower of the Sikh religion at a ceremonial event’ was discussed and an amendment to fully protect the kirpan passed unanimously. The opportunity to fully protect the kirpan was regrettably missed in the House of Commons. Lord Singh became aware of the omission referred to by Baroness Williams towards the end of last year. He immediately contacted the Minister before the Bill came to the Lords and, following discussion, raised the issue at the second reading. Because of his standing in the Lords, he received promises of support from all sides of the House. The Bill then moved to Grand Committee and Lord Singh spoke in detail about the religious significance of the kirpan emphasising that it literally meant ‘protector’ of the weak and vulnerable. Lord Singh briefed Labour, Liberal and others from all sides of the House to say the same. Winding up for Labour, Lord Tunnicliffe remarked that in all his years in parliament, he could never remember such unanimity. Lord Singh’s speech at the third reading and the full debate can be read here. The NSO is grateful to our Director Lord Singh, Lord Paddick, Lord Kennedy, Baroness Verma and unanimous support from cross-party peers to see this important amendment pass. We would also like to extend our thanks to Sikhs in Politics for their support. 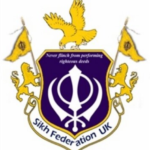 The Sikh Federation UK (SFUK) failed to brief their supporter Preet Gill MP, of the need to ensure protection for the kirpan in the early stages of the Offensive Weapons Bill (OWB). When this was pointed out to them, they met Ministers to introduce protection for ‘religious use’ (which was already protected by the law). They then rushed to self-congratulate with photos with ministers, completely failing to understand that the Bill would prohibit the cultural and ceremonial use of the kirpan. The SFUK should then have approached a Sikh member in the Lords to try to introduce an amendment to protect the cultural and ceremonial use of the kirpan. When their colleagues in the Sikh Council suggested this, they argued strongly against Sikhs in the Lords being involved even if the opportunity for protection was lost. They felt that this would draw attention to their incompetence in briefing Preet Gill MP. True Sikhs would have put the needs of the community before their own egos. Lord Singh, aware of the omission, contacted the relevant Minister before the Bill came to the Lords and, following discussion, raised the issue at the second reading. Because of his standing in the Lords, he received promises of support from all sides of the House. What SFUK are now saying in their jealous tweets, about Lord Singh omitting the religious significance of the kirpan, had already been said by Lord Singh and others at Grand Committee. It is much harder to get an amendment to a Bill in the Lords than in the Commons, and the Home Office (advised by an anti-Sikh group) said that it was difficult to protect a larger kirpan unless there was a clear and easily recognisable description of its physical appearance. Sikhs in the Lords and their supporters saw this as a red herring to create doubt in the minds of the government. A kirpan, whatever its physical appearance, should be protected by legislation for religious and cultural use. There is nothing wrong in saying that in physical appearance a kirpan is a sword to ensure its protection in law. Following the discussions at Report Stage, government officials have had a further meeting with Lord Singh in working towards a suitable amendment to cover Sikh concerns. The SFUK in their continuing efforts to smear those that are trying to protect Sikh symbols and identity, while speaking and writing about the uplifting teachings of our Gurus, are again underlining their anti-Sikh agenda. Our Director Lord Singh continues to work with cross-party peers to ensure the kirpan gets the full legal protection it requires, with proposed amendments to the Offensive Weapons Bill (OWB). 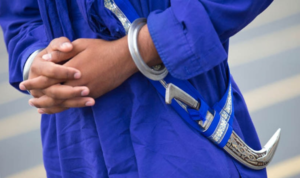 Under current legislation the kirpan has an exemption from the provisions relating to the possession of an offensive weapon under the Criminal Justice Act. All that was required, is to include a clause to protect longer kirpans gifted to Sikhs and non-Sikhs as a sign of honouring contribution to society – recipients of whom include senior police officers and the former British Prime Minister Tony Blair. The failure of Sikh MPs to address this gap in the House of Commons made it necessary for Lord Singh to retrieve the situation. Cross party support was readily given, and Lord Kennedy supported by Lord Paddick tabled an amendment to ensure the kirpan is fully safeguarded under British law. Despite the failure to address this in the House of Commons, on 21st November 2018, the Sikh Federation UK (SFUK) who run the APPG for British Sikhs, bizarrely announced a ‘victory’ on social media with an accompanying ‘photo op’ with Ministers. On 30th January 2019, peers discussed proposed amendments to OWB at committee stage in the House of Lords. Amendment 70 was withdrawn in line with convention in the Grand Committee, however there was unanimous support from all parties including the government, for the need to effect change in order to fully safeguard the kirpan in law. Over the years, the Network of Sikh Organisations (NSO) have become accustomed to their modus operandi. They no doubt, have been particularly successful in plugging their often grievance filled narrative on social media. We have had to address misleading statements made by SFUK regarding their now failed ‘ethnic’ Census tick box campaign aimed at limiting a world religion to a single ethnic group. We are still waiting for them to disclose the list of gurdwaras they say supported their campaign for a separate tick box in the 2021 census. We have concerns given what we discovered about Hounslow gurdwara (Alice Way). SFUK tweeted to say they were one of the gurdwaras who supported their campaign, but the committee categorically refuted this in writing. What the SFUK haven’t disclosed is that following legal action, one of their leading supporters gave Lord Singh a written apology in May 2015 for inferring Lord Singh had given advice to the government that is was OK for Sikhs to wear ‘a wooden kirpan’. It is simply not true and the repeated inference in the statement above posted on Facebook repeats the libel. We’ve discussed why Lord Singh and other cross-party peers were forced to intervene in the 2nd debate on the OWB above. It is to fully safeguard the kirpan in law, something which should have been done in the House of Commons, despite a SFUK declaration of ‘victory’ on the matter and ‘photo op’ with a Minister and the Chair/Vice Chairs of the APPG for British Sikhs (for which they are secretariat). SFUK who’ve previously referred to Lord Singh as ‘a dinosaur’, also complained on Twitter about Lord Singh’s comment ‘we are neither martial, nor are we a race’ – but they failed to include his full speech and context given above. The Guru’s taught us to ‘recognise the human race as one’, and the fledgling Sikh community had to defend itself to survive persecution – the circumstances transformed the community into one which was ready to defend itself and others from tyranny. However, the ‘martial race’ theory was propagated by British military scientists, who wanted to increase enlistment to the British Indian Army during the Great Wars – categorising Gurkhas, Pathans, Hindu Punjabis and Sikhs in this pseudoscientific category. It is not consistent with Sikh teachings. SFUK remarkably tweeted: ‘A martial race is one that is brave and ready for battle. It appears Lord Singh would like to see Sikhs as ‘Indians’ unfit for battle’. 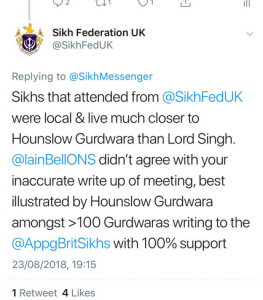 We are not sure what ‘battle’ the SFUK think they are fighting and how Lord Singh’s speech could be possibly interpreted as suggesting Sikhs were ‘unfit’. We do not think it is ‘brave’ to publish misleading posts on social media. The saddest part of all of this is the way in which SFUK’s misleading post which selectively quoted Lord Singh’s speech, has been received by a vocal minority who follow them on Facebook and other social media platforms. The nature of the SFUK supporters is illustrated by comments like the following below which contribute nothing towards a rationale and reasoned debate. Comments on the SFUK Facebook page under the post vary from being plainly rude, conspiratorial, but some disturbingly ageist in nature, like the SFUK previous reference to Lord Singh as ‘a dinosaur’. The individuals concerned should be utterly ashamed of themselves. Following the publication of the despicable ‘karma’ tweet after the death of Sir Jeremy Heywood last November, which the SFUK apologised for, we are by no means surprised by their modus operandi and the odious comments of some of their followers on Facebook. We imagine those in government circles won’t be too surprised either.